Deer And Doe just released their new collection of patterns and I was lucky to receive the Agave pattern a few weeks ago. Agave is a high-waisted A-line wrap skirt with asymmetrical panels. The design is super cute AND version A is reversible! 2 skirts in 1, what’s not to like?! Another great thing about Agave is that it doesn’t require much fabric per side (about 1/2 yard) so I was able to use leftovers from previous projects. For one side, I used a graphic piqué. I love the retro vibe of this one, and I thought it would be interesting to match the geometric pattern at the asymmetric line of the wrap skirt. For the other side, I used 2 faux suedes in beige and caramel to highlight the asymmetric panels even more. I’m happy with how the piqué and faux suedes look together. I wanted the two sides of the skirt to match well enough because it’s a wrap skirt after all and one is likely to catch a glimpse of the wrong side every now and again. However, I wanted the two sides to be different enough so I could diversify my styling options. I cut a size 36 and, as usual, Deer And Doe instructions are well written and easy to follow. 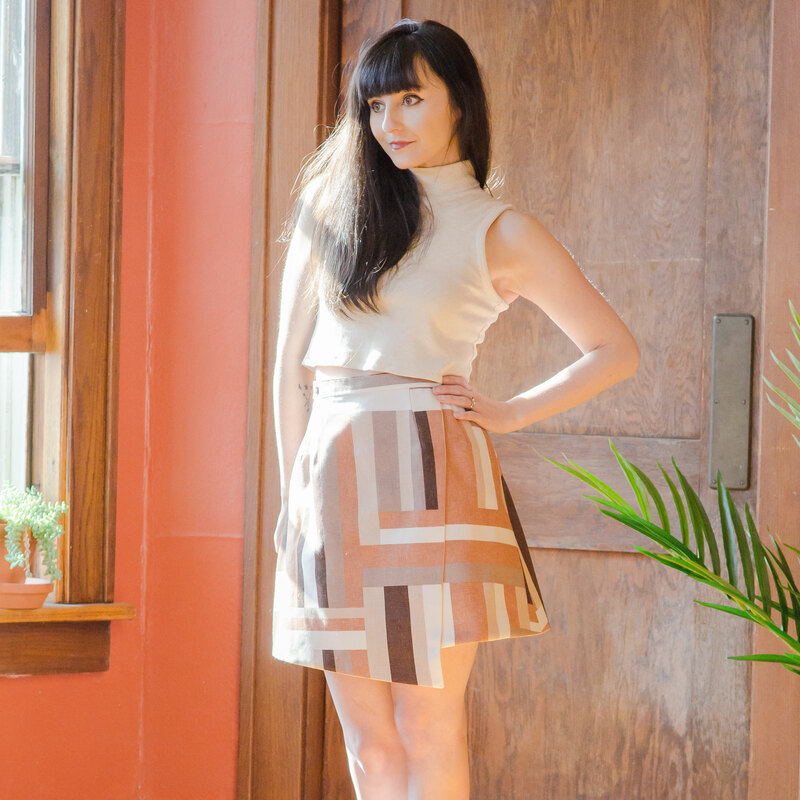 I made this reversible skirt in no time and it fits very nicely. No alteration required. The most delicate part of making Agave for me was the pressing. Because of the reversibility of the garment, I had to make sure to evenly press the seams on both sides. I kept adjusting my iron’s temperature because obviously, the two fabrics didn’t handle the heat the same way, and I used a pressing cloth to avoid any marks on the faux suede. No biggie, it just required a bit of extra attention. I love my new reversible skirt. A denim version is on my to-do list. J’admire beaucoup les raccords de motifs.